Drake and OVO Present HAW2 Mixtapes. 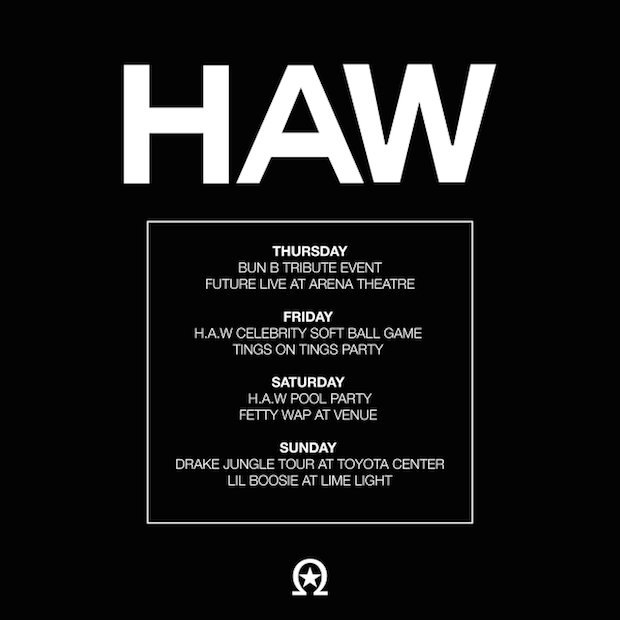 With “Houston Appreciation Weekend” festivities kicking off today, Drake and OVO have revealed the schedule for their second annual “HAW” weekend. But that is not the only treat for the fans. Along with the announcement, yesterday OVO dropped a very significant mixtape by Austin, Texas-based producer Eric Dingus titled “HAW2 Eric Dingus Mix” that features some awesome remixes, several throwbacks and exclusive tracks. To be precise “Push Me Away” by Roy Wood$ along with remixes of Drizzy’s “Connect”, Beyonce‘s “Flawless” & “Blue”, Pimp C‘s “Pourin Up” and so forth. The 30 minute long full-of-goodness mixtape doesn’t end there. Today the OVO camp let go of their “HAW2 Chopstar Mixtape” which is packed with several listen worthy chopped up tracks amongst which Post Malone‘s “White Iverson” makes an appearence as well as PARTYNEXTDOOR‘s “Preach” featuring Drake. Take a listen to the both mixtapes below and check out the schedule for the weekend as well.